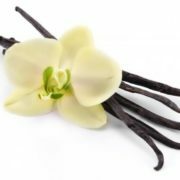 Vanilla is used as a flavoring in ice cream, cakes, cookies, and many other types of food. 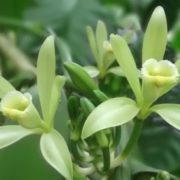 Vanilla beans grow on certain types of orchids in warm places of the world – Mexico, Ecuador, Madagascar, Indonesia, Costa Rica, Uganda, China, India, Tahiti, and the Philippines. 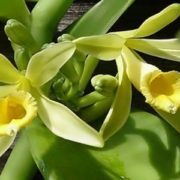 A vanilla orchid has a long climbing stem that attaches itself to a tree trunk or pole. The fruits that develop from large yellowish flowers are long pods (or beans) with seeds. 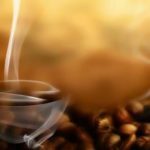 Beans may grow to 20 centimeters long. 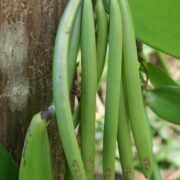 Vanilla beans are processed by drying and storing them. Fermentation creates crystals of a chemical called vanillin. 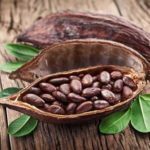 The Aztec of Mexico flavored their chocolate drinks with vanilla for hundreds of years before the Spanish arrived in their lands in the 1500s. 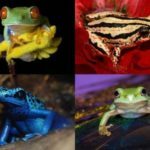 The Spanish introduced it to other Europeans. 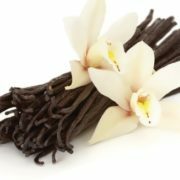 Today vanilla is made from vanillin that is synthesized in a factory. 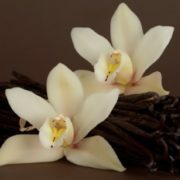 Meanwhile, vanilla can tell a wonderful, intriguing story, full of passions and secrets. 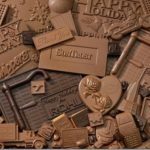 It is used not only in chocolate bars and cookies, but also is added to medicines, perfumes, and even in car tires and paints. 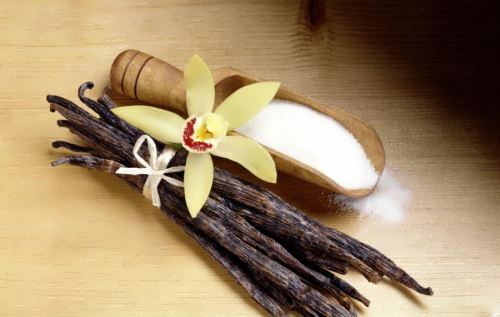 Indians used vanilla as an antidote for bites, treated a sore throat, cough, indigestion, heart malaise, fever and chills shot. 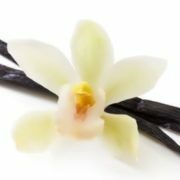 The first mention of vanilla had been done by the Spanish priest in Mexico in 1529. 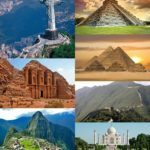 Indians of Central America told a legend. Once upon a time one king had a daughter of great beauty. She was named the Morning Star. The parents did not want her to marry a mere mortal, so made her priestess of the goddess of fertility. Walking through the woods, she met wonderful prince Young Deer. They fell in love with each other. But the priest of the goddess of fertility caught and killed them. 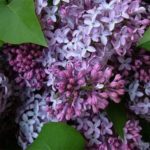 And soon on the site of their deaths lush bush and emerald green curly stem grew. 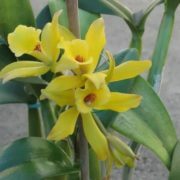 Soon yellow-green orchid appeared on the stem and then there were pods with a subtle aroma. So vanilla appeared on the Earth. 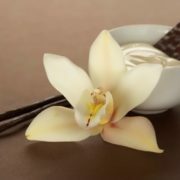 Vanilla is the only edible fruit of the orchid family, the world’s largest family of flowering plants.